Paris at the end of the 18th century. The French Revolution starts with the storming of the Tuileries to overthrow Louis XVI. In 1793 the king and his wife, Marie-Antoinette, meet their death on the guillotine. One of their children, eight-year-old crown prince Charles Louis, dies of tuberculosis two years later, on June 8 1795, in the Temple according to the official historiography. At the same time, however, the rumor spread that an exchange took place, and that the prince was brought to safety in the highest secrecy. As a result, in the beginning of the 19th century, a number of men came forward claiming to be the true dauphin. In 1845, one man, Karl Wilhelm Naundorff, was buried in the Netherlands, and the epitaph on his tombstone reads: 'Here lies Louis XVII, King of France.' In 1998, the Center for Human Genetics, together with the laboratory of Nantes, showed that the remains of Naundorff could not be identified as those of Louis XVII. This conclusion was based in the first instance on a comparative mitochondrial DNA (mtDNA) analysis of Naundorff's bone and DNA samples of two living maternal relatives of Louis XVII and was proved further by DNA analysis of hair samples of maternal relatives, i.e. two aunts of Louis XVII and his mother. The crucial question of the mystery remained, Was it really Louis XVII who died in the Temple or was it a substitute? At the request of the Duc de Bauffremont, the crystal urn containing the heart of the young boy who died in 1795 was opened in December 1999. The heart was indeed removed by the physician J.P. Pelletan from the body of the child that died in the Temple. This relic was kept in a crypt at the Basilique St.-Denis in Paris. Two samples of the heart (muscle and aorta) were taken: one part was investigated in the laboratory of Professor J.J. Cassiman of the Center of Human Genetics of Leuven (Belgium) and the other independently by the laboratory of Professor B. Brinkmann in Münster, (Germany). The aim was to compare the DNA of the heart with that of the maternal relatives of Louis XVII. DNA, a minuscule part of every cell in the body, is responsible for all hereditary properties. It has already been proven that the identification of human remains by DNA analysis is an effective instrument in judicial and historical investigations. Indeed DNA analysis led to the successful identification of the remains of the Romanov family and of Josef Mengele. The present investigation focused on what is known as mitochondrial DNA, and not on the classic nuclear DNA that is passed on to the next generation via sperm and egg. The far smaller mtDNA is found in the mitochondria, the energy factories of the cell, and is only passed down through the maternal line by the egg. Furthermore, there are thousands of copies in one cell, which favors survival in old remains such as the heart being studied here. The sequential order of a robust polymorphic section of mtDNA, i.e. the D-loop (displacement loop) region, divided into two hypervariable regions (HVR 1 and FIVR 2), is most suitable for identification studies and has already been analyzed in samples up to 12,000 years old and even on Neanderthal skeletons. In this investigation, extreme care was taken to prevent contamination in order to obtain accurate results. The heart piece (- 500 mg) was divided into five segments: one segment contained a piece of the aorta, the other four segments were heart muscle. The DNA in the five different segments of the heart was independently extracted by a silica-based method. Both short (between 1 09 and 201 nucleotides) and long (between 214 to 293 nucleotides) fragments of the mtDNA D-loop were amplified by the polymerase chain reaction (PCR) and analyzed by direct sequence analysis on the automated ALF DNA sequencer (Figure 1 shows an example of a piece of the mtDNA sequence). DNA was obtained in all five heart segments. Quantitation of the number of mtDNA copies surprisingly revealed that the heart contained relatively high amounts of DNA fragments. The number of mtDNA copies of a length of 131 nucleotides in the DNA extracts of the heart muscle varied from 1260 to 3750 copies/pl DNA extract and the number of copies of the longer 258 nucleotide fragments from 3 to 17. On the other hand, the number of copies in the aorta extract revealed for the short fragments only 12 copies/pl DNA extract and 3.5 for the long fragments. The fact that in general much more DNA was obtained for the short pieces, compared to long pieces, indicates that the DNA is very degraded but also that authentic DNA was obtained. Sequence analysis of the long PCR fragments in the five different DNA extracts of the heart piece did not always give straightforward results. Since the heart DNA was degraded into small fragments this is not surprising. On the other hand reproducible sequencing results were obtained for the short PCR fragments. For three DNA extracts of the heart muscle, identical mtDNA D-loop sequences were obtained which differ in five nucleotide positions from the Anderson international reference sequence, namely nucleotide 16519, 152, 194, 263 and 315.1 (Table 1). In one DNA extract of the heart muscle, the same D-loop sequence was also observed but with very minor contamination. The D-loop sequence of the aorta segment revealed also a double sequence at position 152, position 194 could not be analyzed. The last two DNA extracts contained however less DNA than the others (especially the aorta extract). Based on these resuits, one can consider that the mtDNA D-loop sequence with C at position 16519, C at 152, T at 194, G at 263 and C at 315.1 as the consensus heart D-loop sequence and therefore as the authentic sequence (Table 1). 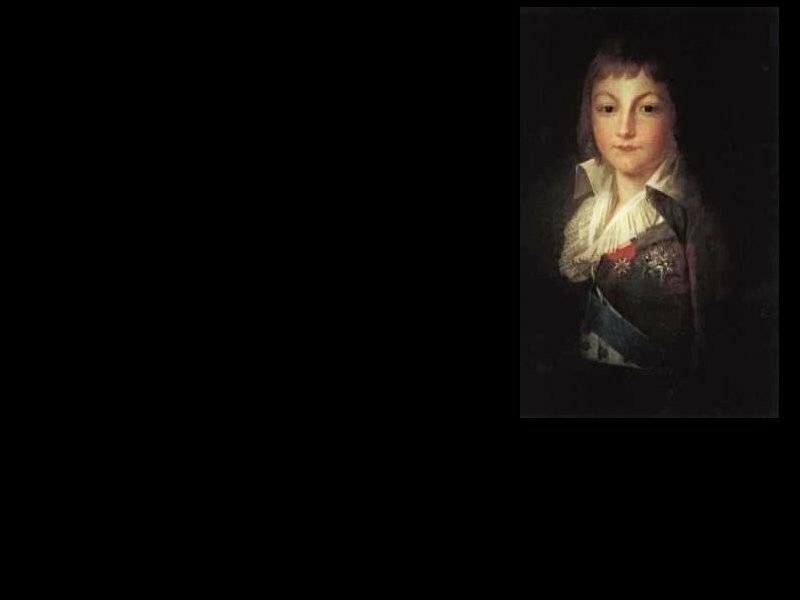 To prove that the heart of the young boy who died in 1795 is from Louis XVII, one needs to compare the heart D-loop sequence with those of maternal relatives of Louis XVII. The mtDNA D-loop sequences of maternal relatives, i.e. two aunts of Louis XVII (Johanna Gabriela and Mada-Josepha), his mother, Marie-Antoinette, and two living maternal relatives (Queen Anna of Romania and her brother André) (Figure 2), were obtained in the Naundorff study. The obtained consensus heart mtDNA D-loop is identical to the sequence of the living maternal relatives of Louis XVII (Table 2). For the other maternal relatives of Louis XVII there is also a match when HVR1 is considered (for HVR2 no result was obtained in the hair samples of Johanna-Gabriela, Maria-Josepha and Marie Antoinette) (Table 2). The match observed between the mtDNA D-loop sequence of the heart and of maternal relatives of Louis XVII, provides very strong evidence that this heart belongs to a child that is maternally related to Marie-Antoinette. To avoid contamination extreme care was taken during all steps of the analysis. The piece of heart tissue was divided into three segments and the piece of the aorta into two segments. DNA was extracted from each piece of tissue by two different researchers using two different methods: the phenol-chloroform method and a silica-based method. Both regions of the mtDNA D-loop (HVR1 and HVR2) were amplified by the polymerase chain reaction using two sets of primer pairs for the long and 5 primer sets for the short fragments respectively. MTDNA could be obtained in two DNA extracts from the heart and in one of the aorta with both extraction methods. DNA sequencing was carried out on an ABI Prism 310 automated sequencer and BigDye Terminator sequencing reagents (ABI-Perkin Elmer, Weiterstadt, Germany). The base calis from the forward sequencing reaction were confirmed by a reverse direction sequencing reaction for each DNA fragment. The analysis of mitochondrial DNA sequencing data was performed on a Macintosh computer using the Sequence Navigator software (Version 1.0.1), ABI. HVR1 was analysed between the nucleotide positions (nps)16024 and 16365 and HVR2 between nps73 and 340. The sequence data were compared to the international reference sequence and two investigators checked all sequences. The sequencing results of the heart and the aorta for the long mtDNA fragments showed an overlap of signals at three sites in the long fragments. This overlap of signals did not occur in the short mtDNA fragments. This indicates that the DNA from the tissue was mildly contaminated by DNA from an investigator. The sequencing results obtained for HVR1 were identical to the Anderson reference sequence (Table 1). For the DNA extracts from the heart and the aorta identical sequences were obtained for the short HVR2 fragments, which differed in four nucleotide positions from the Anderson reference sequence, namely nucleotide position 152, 194, 263 and 315.1 (Table 1). Since the DNA was highly degraded and existed mostly in small fragments in the samples the results of the short fragments can be considered as the consensus heart sequence in the second hypervariable region (Table 1).
. General conclusion The results of the mtDNA analysis of the heart at the Center of Human Genetics (Leuven) and at the Laboratory in Münster show that the heart mtDNA D-loop sequence and the sequence of maternal relatives of Louis XVII are identical. This sequence has not yet been observed in hundreds of tested individuals. These results support very strongly the official version that Louis XVII and not a substitute died in the Temple in Paris on June 8 1795.